Various efforts were made during the early 1960s to tackle the problem of either preserving the Merz Barn as an entity, or of removing the artwork to a safe place. Harry Pierce, on whose land the Merz Barn was, and who therefore was seen as the de facto custodian, had no special wish to keep the work, which was preventing him from using the barn. The artwork was part of the wall – made directly onto its surface, with Schwitters as he applied plaster to the surface selecting some of the stones for special emphasis. 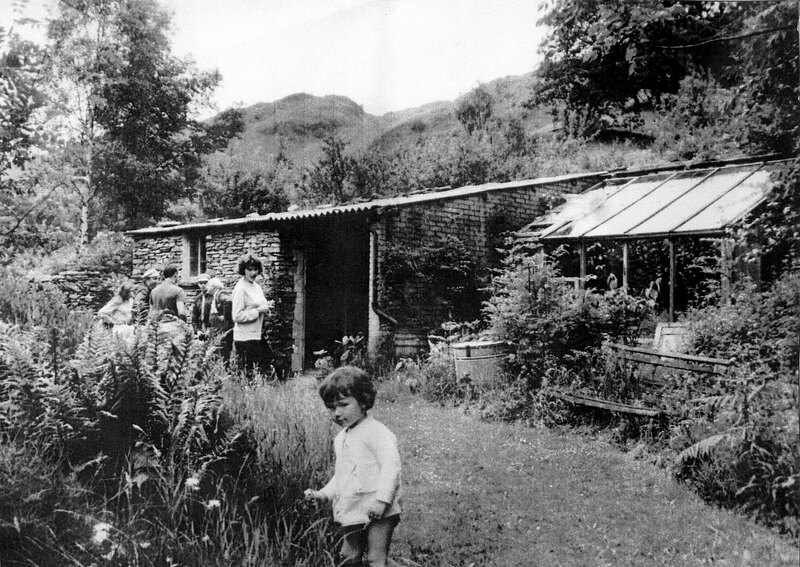 So the whole wall was on offer, first to the Tate, who rejected it on the grounds that moving it was unfeasible without damaging the already fragile surface, and then to the Abbott Hall museum in Kendal whose curator, Mary Burkett, had set up the first exhibition of Schwitters’ work in the Lake District, and who was a strong champion. But at the time she was a junior member of the Museum team, and had no way of raising the £3,000 that Harry Pierce was asking. Visit to Cylinders by Richard Hamilton in 1965. Photo: Bob Smithies of The Guardian. Hamilton can just be seen, in his characteristic cap, talking to Harry and Ida Pierce on the far left. 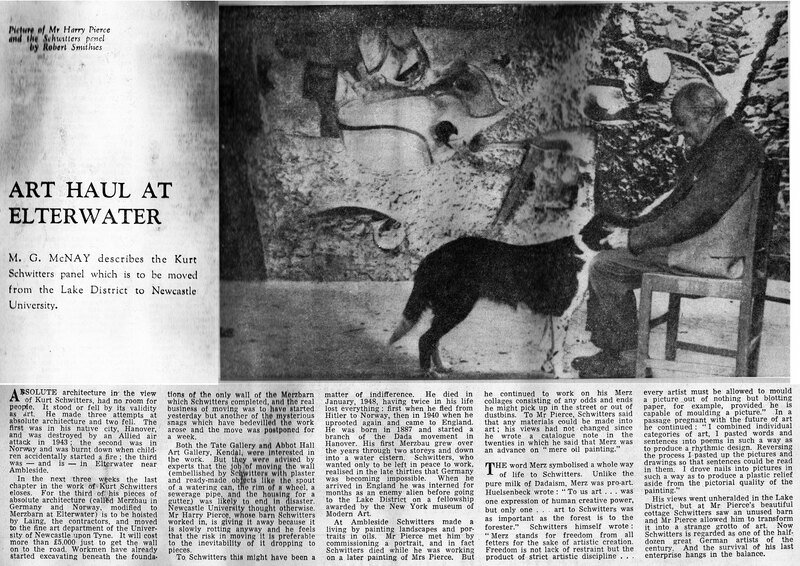 The problem was solved, rather sadly for Langdale, by an enthusiast for Schwitters’ work at the University of Newcastle, Professor Kenneth Rowntree managing to find the money from the Arts Council’s percent for art scheme to transport the Merz Barn wall from Cylinders to the University’s Hatton Gallery, where a new gallery was created to take it. In this he was strongly supported by artist Richard Hamilton, then an assistant lecturer in the Fine Art department, one of whose students, Fred Brookes, helped with the move, and took the photographs and made site drawings. The Laing construction company undertook to manage the actual move. The Merz Wall being hoisted up out of the barn for removal to the Hatton Gallery, Newcastle (Photo © Fred Brookes). Since the wall was fragile it had to be moved in one piece, and a metal lifting frame was welded in place around it to allow it to be lifted out in one section. Lowered horizontally onto a pantechnicon the wall was transported to Newcastle, on 22nd September 1965. Article in The Guardian by Mike McNay, Sept. 25th 1965. After the work arrived in Newcastle it was stored, still in a horizontal position, in a frost-proof environment until 21st January 1966, when it was lifted and lowered into the Hatton Gallery through a slot cut into the roof. Now in the care of the Tyne and Wear Museums service, the Merz Barn wall at the Hatton Art Gallery is being promoted as one of the N E region’s international cultural treasures, and forms the centrepiece of the Great Northern Museum’s art collections. Tyne & Wear Museums Director Alec Coles in front of the Merz Barn with corporate sponsors, Barney Frith, partner at Watson Burton LLP and Charles May, managing director at Brewin Dolphin. The Hatton Gallery is now in the process of having Schwitters’ Merz Barn artwork cleaned and restored, as part of a major renovation of the Gallery. The Merz Barn artwork in the Hatton Gallery. Visit by conservation experts 2009.